The emergence of Europe as a unified trading block has profound implications for those who do business with European countries. European Union Law is written for lawyers and business professionals who require information about the changes that are taking place as a result of the unification process in the member states of the European Union. 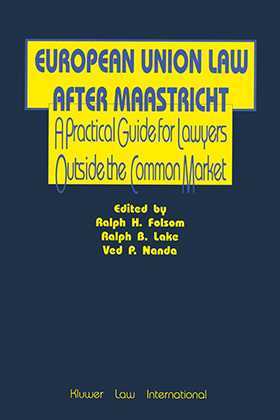 Unlike other materials on Europe, this book is written primarily for lawyers outside the EU. It examines the European regulations of some important specific industries such as broadcasting and telecommunications. The editors and authors of this work are among the most prominent academic and professional authorities in the area of European Law. This book is the single most useful reference tool for those in need of current European Union information.